For some homeowners, finding a sensible home comfort solution that is also affordable can feel like an unsolvable case. For example, traditional central air conditioning systems may be too expensive or impossible to install in homes and buildings without ductwork. Luckily, there’s a solution: ductless mini-split systems. Ductless mini-split systems are the cost-effective answer for homes and buildings without ductwork. They are quieter, simpler to install and significantly more energy efficient, costing up to 40 percent less to operate. Plus, they do a superior job of improving indoor air quality by reducing the amount of indoor contaminants that can enter homes through the ductwork. And, ductless systems are equipped with built-in air filtration that helps reduce dust, bacteria, allergens, pollen and other particulates. Mini-split systems are ideal for older buildings constructed before central air conditioning was widely used and for buildings with plaster walls and brick facades. They can be used for additions, offices, enclosed sunrooms, screened-in porches, classrooms, home gyms and more. Mini-split systems are sleek, compact and can be mounted on the wall or ceiling. 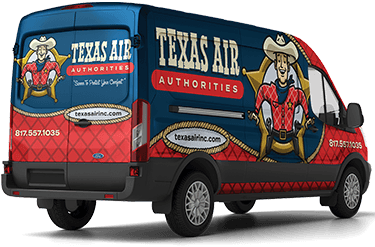 Texas Air Authorities installs, services and maintains a wide variety of mini-split systems. We’ll help you capture the home comfort you deserve without breaking the bank. After sizing up the space in your home, our crackerjack team will help you choose the system that’s perfect for your needs and your budget. We’ve handled more than our fair share of these cases, which means we have the skills and experience to install your system quickly and professionally. Our technicians are firm believers in law and order. We’ll carry out your installation to the letter of the law while treating your home with courtesy and respect. We’ll clean up after ourselves. When we ride off into the sunset, the only evidence you’ll find to prove we’ve been there is your up-to-date, reliable, energy-efficient ductless mini-split system. In addition to ductless mini-split systems, we have an arsenal of quality products and services, including AC replacement and installation, AC repair, AC maintenance and more. Our trained and experienced technicians are the sharpshooters you want defending your comfort when it matters most. Fill out our online form or call us at 817-402-3576.